A romantic drama, Labor Day is the tender story of an unlikely love blossoming under emotional stress. Director Jason Reitman and stars Kate Winslet and Josh Brolin deliver a quiet, moving exploration of two damaged souls connecting in remarkable circumstances. The film is set in a calm suburban New England town in 1987. Severely depressed since her husband left her, Adele Wheeler (Winslet) is raising her 13 year old son Henry (Gattlin Griffith) on her own. At the start of the Labor Day long weekend, escaped and injured convict Frank Chambers (Josh Brolin) forces his way into their house to hide for a night, intending to jump onto a train the following day. But Frank is not a naturally violent man, and his surprisingly affectionate treatment of Adele and Henry touches a chord. She is desperate to reconnect with a man, Henry longs for a father figure, and with fewer trains running on the weekend, Frank ends up staying longer than expected. He makes himself useful around the house, and a family dynamic starts to evolve. But the police search for Frank is incessant, nosey neighbours start to notice that things are different at the Wheeler's place, and Adele may still find herself in peril for harbouring a fugitive. Directed and written by Jason Reitman, Labor Day is a beautiful film, a journey into the mysteries of love where a connection can blossom in the unlikeliest contexts. Reitman fills the movie with delicate scenes of normalcy in an abnormal weekend, life progressing despite the confluence of one woman's depression with one man's desperation. As Frank settles in for what should be a short stay at Adele's house, he should not want to be there any longer than necessary and she should not want him to stay a moment longer than he wants to, and yet both feel the tug of the human heart drawing them together. Simple as the main story is, Reitman also has secrets to reveal, in the form of the events that drove Adele into depression, and separately, the crime that landed Frank in prison for murder. One of these histories is primarily revealed in one heart-wrenching scene, while the other unfolds through enigmatic snippets of events that will only be assembled late in the film. Meanwhile, Henry as an adult (portrayed by Tobey Maguire) narrates the film, and the young teenager becomes the third point in the triangle of affection, needing both a better functioning mother and a resourceful father figure. 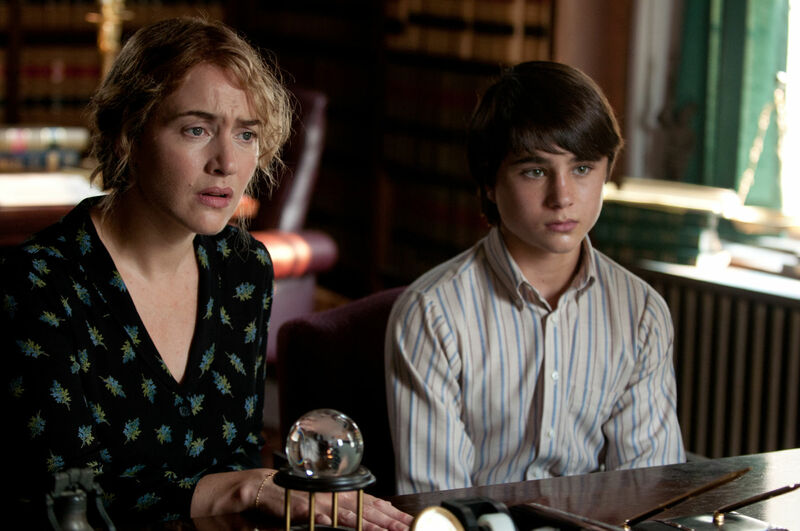 Henry's reaction to the quickly evolving adult emotions around him, including the insecurities that arise when his mother's attention suddenly reorients to Frank, add to the film's impact. The performances from Winslet and Brolin are exceptional, allowing the drama to unfold with no dramatics. Instead they both portray less than perfect people struggling against a flawed present and weighing the risks that need to be embraced for a better future. Labor Day finds an emblematic highlight in the unlikeliest of scenes, Frank making good use of over-ripe peaches and guiding Adele and Henry through the process of preparing a pie. What comes out of the oven is not just a perfect pie, but a perfect film.